’Hammond (Univ. of Southampton, UK) provides valuable insights as she surveys the existence of Great Expectations in editions and adaptations from the time of its publication into the second decade of the 21st century. … Carefully researched and meticulously documented, this study follows the novel’s fortunes as it endured a stretch of unpopularity and finally emerged as an international literary icon. The extremely useful appendixes include a select list of British and American editions, largely focusing on the first 50 years of the publishing history; a list of translations into 47 languages; stage, radio, film, and television adaptations to 2012; and 39 contemporaneous reviews from British and American periodicals, half during the serialization. Required reading for Dickensians, the book will also be valuable for those interested in the history of publishing and media. 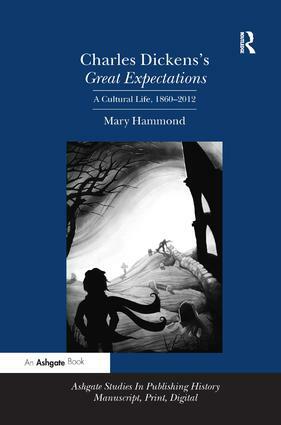 … Highly recommended.’ Choice 'Mary Hammond's study of the afterlives of Great Expectations is an excellent, deeply researched cultural history, full of new information about the reception, re-mediation, global circulation and impact of what is often seen as, but turns out not always to have been, Dickens's signature novel'. John O. Jordan, University of California, Santa Cruz, USA ’Great expectations are here fulsomely rewarded. Hammond’s sprightly exposition combines prodigious research with acute interpretation. The combination yields many surprises and revisions of the story of Dickens’s reception and re-mediation over the last 150 years. Not to be missed by anyone interested in book and media history’. Robert L. Patten, Rice University, USA 'Mary Hammond's enormously entertaining and vivid book … approaches the novel from a variety of angles, all of them illuminating … She gives a detailed and humorous account of the history of its reception … Great Expectations has meant a lot of different things in its 150-odd years, and no one has teased out so many of them so accurately. Contents: Introduction; The entry of a new novel into the western world, 1860-1870; Afterlife in the West, 1870-1900; Great Expectations in the new media age, 1900-1945; The entrenchment of a ’classic’, 1946-2000; Translating Great Expectations, 1860-2012; Coda; Appendices; Bibliography; Index. Mary Hammond is Associate Professor of Nineteenth-Century Literature and Culture at the University of Southampton, UK. She is the author of a number of books and articles on nineteenth-century book history including Reading, Publishing and the Formation of Literary Taste, 1880-1914 (Ashgate, 2006).